The front cover is an elegant, enchanting and gracefully seductive representation. 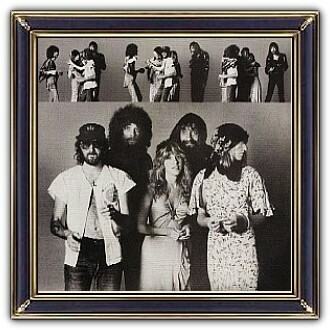 It features a stylised shot of Mick Fleetwood and Stevie Nicks engaging in something resembling old-fashioned courtship. 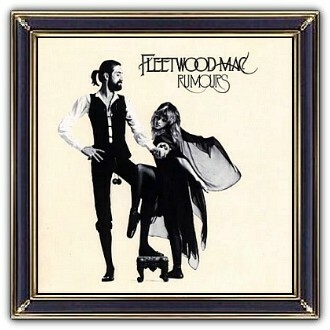 During the recording sessions chaotic intimate relationships between bandmembers, after various separations, started to have a negative effect on Fleetwood Mac and 'rumours' spread. From this point of view the albums' title is chosen very well. Even more if you consider the content of the lyrics and all the 'illusions of love'. Nevertheless; the front cover seems to spread even more rumours. Why are the other band members not on the front cover? 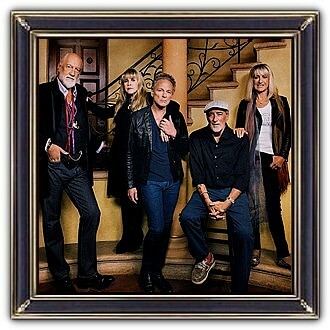 Why has Stevie Nicks, dressed in her 'Rhiannon' stage persona, wrapped her leg over the leg of Mick Fleetwood? What kind of togetherness does this suggests? They were not yet lovers ... or were they!? What is the meaning of the wooden balls? And what about the crystal ball held by Mick Fleetwood? What is the meaning of these artefacts? Rumours is a tangled web of personal emotions and with this in mind the front cover seems to fit the story. It might be designed to stretch relationships to a breaking point ..... and maybe it's not. The case of the wooden balls might be first example of this. Mick Fleetwood explains in an interview that they are toilet chain-balls, snatched from a club where Fleetwood Mac played in their early days. He kept them as a good-luck piece. Maybe that's all; maybe not at the moment he posed for Rumours ....! Nevertheless the way they are brought in focus, still appeals to everyone's imagination and they still are one of Mick's artefacts when he's on stage. He kept them as a good-luck piece - they never broke up!! Rumours is a tangled web of personal emotions and with this in mind the front cover seems to fit the story. It might be designed to stretch relationships to a breaking point and maybe it's not. The crystal ball might be another example of this. Studying the crystal ball held by Mick Fleetwood, the distorted image in it is not that of him and Stevie Nicks as you would expect. It is actually a distorted image of him and John McVie also used on the previous Fleetwood Mac 'White Album' but now rotated through ninety degrees. Maybe another hidden message towards the problematic relationships in the band in those days. McVie and Fleetwood were the only surviving original members of Peter Green's Fleetwood Mac! - And they still are!! The magic of a crystal ball! ?